Summary: "After a year at the king’s palace, Miri has learned all about being a proper princess. But the tables turn when the student must become the teacher! Fans of Shannon Hale won’t want to miss this gorgeously woven return to this best-selling, award-winning series." Review: Miri is back in this final Princess Academy story, and her adventures which have heretofore taken place in the mountains and in the royal palace, are now taking place in a small, forgotten swamp at the edge of the kingdom. The first thing that struck me about this story was how clearly I could feel the setting: the sticky humidity, the slow nights sitting on the porch, the mosquitoes, the caiman, and everything else about the setting just reeked of swamp life. I once had the chance to visit the Amazon, and this story really brought me back to the heat, the rivers, and the many, many bugs. Although swamps are not my ideal vacation settings, while reading I found myself really wanting to go visit another one. Hale makes the slow life watching fireflies with friends sound downright charming. And, coming from me, that's really saying something. Bonus points to Hale for making the setting come alive and feel desirable. The other thing that Hale nearly always does well is stick to happy themes. I love a good story about friendship. The themes of friendship and acceptance are as strong as ever in this book as in the first two books. I feel like I've read many stories lately that feature betrayal and broken trust, and it was lovely to read a story that features loyalty and love instead of selfishness or revenge. It's not that the characters don't have the option to be bitter and deceitful, it's that they do have that option and yet they choose to be better. In that sense it was a happy and refreshing read. The plot was fairly straightforward, but there were a couple of twists that made this story just a little unpredictable. I enjoyed watching everything play out. While I was pretty certain it would end in a certain way, I had no idea how we were going to get there, and I enjoyed the exciting journey very much. The characters were lovable, though I occasionally wished they weren't quite so charming all the time. The never ending wit, while funny, sometimes felt too contrived and would sometimes take me out of the story. But I am willing to forgive an overabundance of wit. It's certainly better than not being funny at all. Overall, I think readers will be happy with this novel. It stays true to the themes and characters we've already met, while pulling in some totally new characters and giving us a completely new story. I'd recommend these books to anyone aged 8 and up. Bottom Line: Witty, warm, exciting, and everything else you'd expect from Shannon Hale. Readers should be very pleased with this final installment to the Princess Academy series. 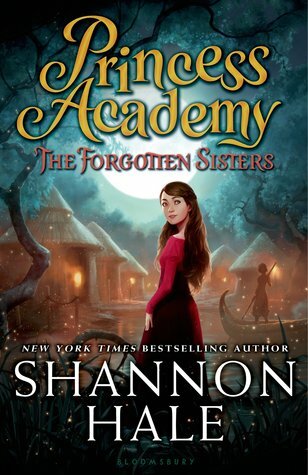 Princess Academy and Palace of Stone are my favorite Shannon Hale books. I'm excited to read this one. I've only read the first book in this series. It's been so long that I can hardly remember it. Maybe it's time for a reread and a catch up. There was a pretty big gap between my reading the first and second book, but I managed alright. It's cute enough for a reread, but I don't think it's necessary, if you just want to jump right in.